The first PADI Tec 45 and Tec 50 courses in Indonesia have been conducted by Blue Season Bali’s head Technical Instructor and PADI Course Director Tom West. Tom had two students, Paul and Amy, both from the UK, who were ready to undertake the challenge it takes to become fully-qualified technical divers. Assisted by technical diving intern Russell, the course was sure to be a success from the outset. The Tec 50 components took place in north Bali, at the world-famous dive sites Puri Jati and Menjangan. Our team checked into a resort overlooking the Java Sea which would be our home for the next three days of intensive training during the PADI Tec 50 course. On the first day, we did some training work at PJ and encountered a sweet robust ghost pipefish during the drills and skills! As in the previous courses, Russ ran video for later use in debriefings, which is vitally important for student feedback. We made two additional training dives for the PADI Tec 50 course, including one skills dive exclusive to the Tec 50 course held at BSB. This additional dive was focused on more effective trim management, tank shuffling, runtime adjustments and avoiding delays in gas switching. 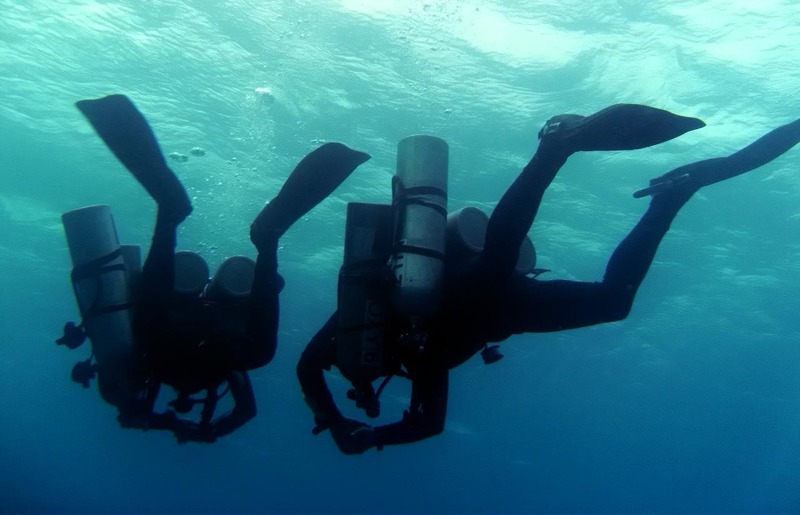 All of these skills will make your technical diving more precise and more controlled- increasing your ability to undertake technical diving safely. The final day of the Tec 50 course was the day we had all been waiting for. As we met for breakfast, the sun was out, the sea breeze was pleasant and we all knew the trip up to Menjangan would be fantastic. We arrived in the national park and did our first dive to 50m dive at Cave Point on the south side of Menjangan Island. The visibility was 25+m and decompression was sweet exploring the cracks and crevices on the reef at 6m. Total decompression time: 37 minutes. Our second dive was made after a surface interval and lunch on the beach at Pos 2. We then decided to make our descent right there into the deep crevasse under Pos 2 and complete our decompression at Bat Cave due to the gentle drift developing on the south side of the island. The topography of this particular part of the reef lends itself brilliantly to a multi-level bottom profile before ascending into decompression. Total decompression time: 39 minutes. As a technical diving instructor, it is a proud process to see students develop and exhibit situational and team awareness. This is what we saw from Paul and Amy as we moved through the PADI Tec 40, 45 and 50 courses. So, guys, hats off to you. You have accepted the challenge of technical diving and risen to meet its call. And what did they have to say about their technical diving course here at Blue Season Bali? Amy: “I can’t remember the last time something made me that frustrated, but I’m so glad to have taken the course!” Yes Amy, it’s a challenging process and you two made fantastic improvements in your technical diving skills. Welcome to the world of technical diving! So, what will your technical diving course be like with us here in beautiful Bali? Email us to find out.